“Conventional email programs and newer cloud-based services such as Gmail let users organise incoming email using folders and filters. But most people cannot be bothered or do not know how to set up the filters, says Sara Radicati, CEO of analyst firm Radicati Group. That has spurred the development of “inbox management solutions” that automate the filtering. 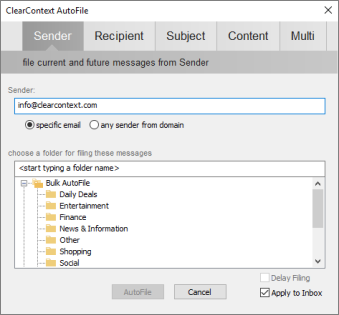 For example, ClearContext offers a plug-in for Microsoft Exchange that highlights important email and automatically files unimportant email from automated senders. In similar vein, Google recently added a “priority intray” feature to Gmail that tries to guess which emails are most important. Posted by brad at 11:07 am on February 23rd, 2011. Rename AutoFile filing groups via ClearContext > Options > AutoFile. When creating an AutoFile rule, you are now given the option to select a sender or domain based rule. Disabled filing groups with no unread messages are hidden from the AutoFile group list in the Dashboard. 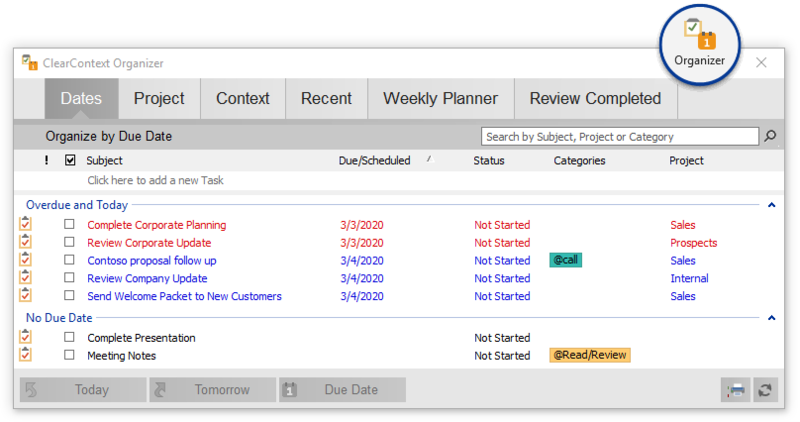 Right click tasks in the Dashboard or Organizer to mark them as Next Actions. A small arrow will appear next to those items you have identified as Next and a category of !Next will be assigned to the task. Projects with Next Actions assigned will show a small arrow next to them in the Summary Dashboard. 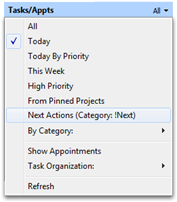 Use the Next Action filter on your task list in the Dashboard to see only those tasks marked !Next. 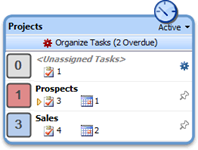 Quickly add a task via the new Add Task feature at the bottom of the Organizer. Take a gander at our updated GTD setup guide for more detail on incorporating Next Actions into your workflow. The User Guide has been updated as well. The v5.3 upgrade is complimentary for registered v5 customers, registered v5-TWC users and active Connect members. Download here.